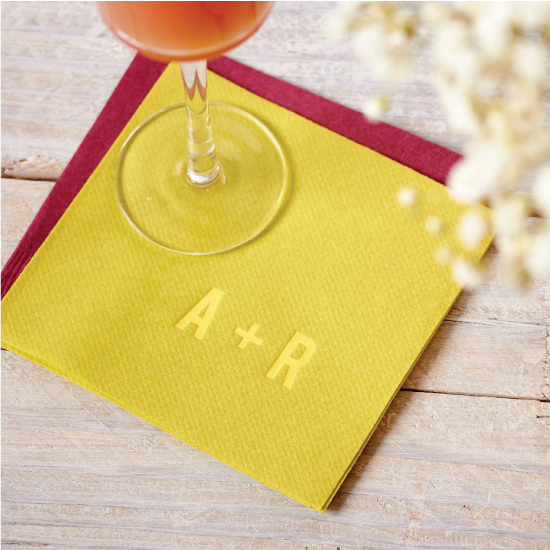 Let us help you create party essentials like custom napkins, matches and more. Whether you're personalizing a product, having trouble with our site or are interested in learning more about ForYourParty.com, our professional staff is ready to answer any question. Click here for Affilate Info. After placing your order, you will receive an immediate Order Confirmation within your internet window, as well as an email with your order number and product details. Please check the Order Confirmation carefully and let us know ASAP if any changes need to be made. Spelled your new last name wrong—it happens! Changes to your order must be received before 11 a.m. CT the following business day. Changes made after 11 a.m. CT will incur a $10 fee per item being altered. Please submit all changes by email to with "Order Changes" and your order number in the subject line. Most standard personalized items will be shipped within 5 to 10 business days of order receipt, Monday-Friday. If an item you have selected is temporarily out of stock, we will contact you to advise. However, please note that orders can take slightly longer to fulfill during our busy seasons. We make every effort to get your order out the door as quickly as possible and will always ship in time to meet the need by date on your order. Expedited shipping is available at the time of checkout, and production rushes are evaluated by order. Please call or chat to request a rush. If there is no tracking information for your order number, your order is still in production and will be shipped to arrive by the in-hands date you selected.